THE XENA SCROLLS: An Opinionated Episode Guide (601 & 602) | THAT'S ENTERTAINMENT! This episode provides a nice transition from the end of the fifth season to the stories that the series tells in Season Six. Also, we meet Varia, the most interesting Amazon introduced since Season Two’s Velasca, a feistier Amarice — just as arrogant, but more dangerous. She’ll play an important role in several future episodes, and she’s given a nice introduction here, one that helps to reckon Eve’s past as Livia with her present/future as a follower of Eli. Meanwhile, “Coming Home” also officially offs the Furies, whose death in “Motherhood” didn’t make the final broadcast cut due to time limitations. Where the episode doesn’t work, in my personal opinion, is the interactions between Xena and Ares, as all of their dialogue (and behavior — whether Furies driven or not) seems one large contrivance, particularly as the episode goes along. Suffice it to say, the script and storytelling lack the finesse of early season efforts, and ultimately, although the premise itself is intriguing, the multiple threads don’t quite come together as best as they should in the end. So, though it’s an important and perhaps necessary episode, it is no more than middling. Although “Girls Just Wanna Have Fun” and “Gabrielle’s Hope” were designed and have elements that riff on the horror genre, it’s a bit of a shock that it took until Season Six for a series produced by Raimi and Tapert to deliver an honest-to-goodness fright fest. The episode is filled with all the familiar tropes, but connects them to Xena by giving us one final chance to see Cyrene (as a ghost) and establishing a two-episode arc in which Xena defeats the ruler of Hell, Mephistopheles, and therefore must take his place. Like the above, it’s a cool story, and it ends up being fairly well executed. Unfortunately, some of the dialogue is beyond trite, and Eve is never more annoying than she is here (and in the proceeding installment), hampering what is otherwise a decent script. My lack of love for the episode, however, stems from the fact that I wasn’t fond of the series’ dabbling in Christianity and the concepts of Heaven and Hell. So even though there are some fine moments (like the vision Xena has of Cyrene slapping her after Lyceus’ death), the premise of the installment leaves me cold. If of these kind of stories you are fond, then perhaps you’ll enjoy this episode. 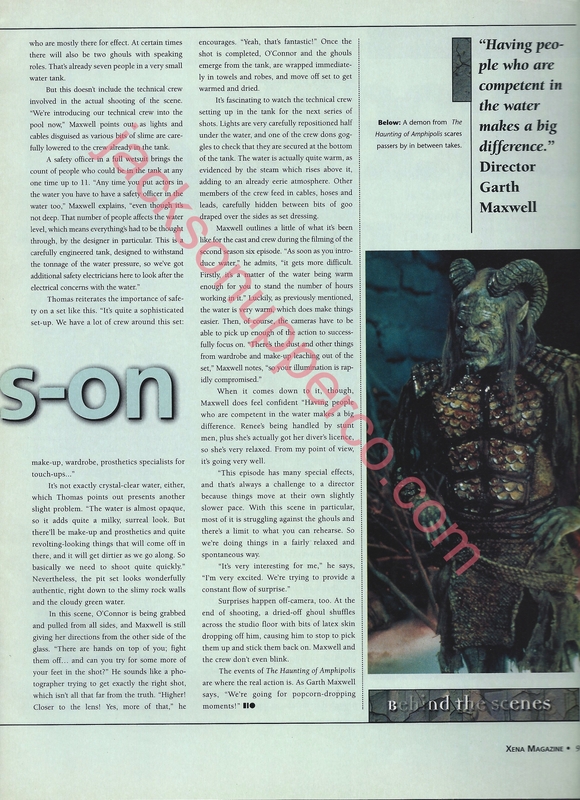 Here is an on-set report of the production of “The Haunting Of Amphipolis” from Titan: The Official XENA Magazine, Issue #13.